There are many types of Girl Scout seals from the United States that can be collected for historical interest that advertised or promoted this movement. The Hinds Cream seal is printed using a four color process in the 1912-1915 era. It also had advertising in black on the reverse. 25th Anniversary of Girl Scouting seal. Slogan proclaims "Girl Scouts Today- Leaders of Tomorrow." Girl Scout label printed in brown ink on brown paper from early 1920's. Seen on official envelopes and letters of correspondence from the Girl Scout National Headquarters. This seal asks guests to the 1939 New York World Fair to visit the Girls Scout Chalet. Note the similarity to the design of the U.S. commemorative issue. The Trylon and the round Perisphere were distinct landmarks of the Fair. 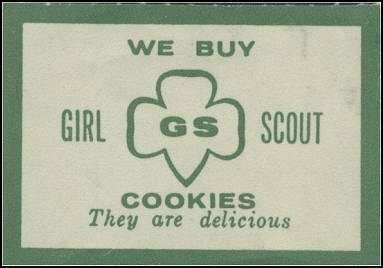 These are early Girl Scout Cookie Sale window label used to indicate the home had alreay bought cookies. Issued for the first time in 1938 by the national organization, these seals appeared through 1942. Their object was to assist the local council in promoting the event. Since then these seals have been furnished by the bakeries supplying the cookies. Up through 1942 there were five different seals; since then their design changed each year and are quite numerous. These labels were printed during World War II. The round design might have been an insert for a pin-back badge. These perforated and gummed labels were used in promoting the American Girl magazine. SOSSI JOURNAL, Volume 26, Number 3, March 1977. Updates and modifications by Keith Larson, 2000.